Fisher Cat Family includes Father Schroeder, Mother Isabel, Brother Linus and Sister Lauren. Mother Isabel Fisher can often be seen and heard tending to her luscious garden as she engages in her favorite things, gardening and opera. Father Schroeder is know for his fine house building skills while brother Linus and sister Lauren work hard at keeping their parents on their paws. The Fisher Cat Family is a part of the Calico Critters Collection by International Playthings. 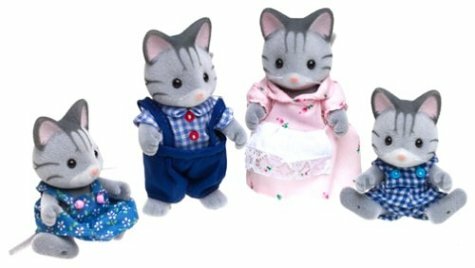 Fisher Cat Family is for use with Calico Critters doll houses and furniture, other similarly sized doll houses, or just for creative play!